Well begun is half done – this age old saying fits ‘A Matter of Time by Shashi Deshpande’ most smugly. Usually, a novel begins with a vague description of season and weather or a half understood striking event, created more to grab readers’ attention than any real relevance to the story. But in the present novel under review, the author most ingenuously set the tone of the novel, by introducing a Bungalow. Yes, you read it right, the poignantly serious, sombre story begins with a vivid description of a big house, named Vishwas, literally trust or faith. While, Shashi makes it amply clear in the first few lines itself that the bunglaw is named after a worthy ancestor, and actually has nothing to do with trust. But, as a reader, I instantly connected with this house. I had a hunch that the non living entity is going to play a major role in the story. And, as if to confirm my view, Shashi went on to describe the history and architecture of the bunglaw, intermingling it with its present inhabitants. As the architectural nuances were pointed out, it became clear that fate of both the house and its inhabitants is distinctly divided into two worlds – one is sunny, airy, vibrant, and the other dark, dismal, gloomy. The play on the name is brilliant, as the house is a mute witness of betrayal of trust for last three generations, and the family history, much talked about is actually the cause of tiff and bad luck! The actual story begins in the second chapter, with Sumi watching an old movie on TV. A simple middle class setting in stark contrast to the magnanimous Big House surprised me, and almost immediately it was followed by a big surprise in Sumi’s life as well. Her husband of twenty years walks out of marriage, without specifying any reason for desertion. Gopal, an ex Professor, a sensible, educated man does not think twice before leaving his wife and three grown up daughters, and strangely, even Sumi does not ask any questions. At this juncture, I was left dumbstruck at the uncertainties of life and just like Aru, Charu and Seema was gasping at the sudden tragic turn their lives have taken. But little did I know that Gopal’s desertion is just a tip of the iceberg. The insensitive betrayal and unexplained willful abandonment actually run much deeper in this story. The roots of Gopal’s action can be traced to the rift in Sumi’s family, her own parents, Kalyani and Shripati have not talked to each other for last 30 years despite living under the same roof. Now, as history repeats itself in Sumi’s life, she is brought back to her parents’ house, the ill fated Bunglaw Vishwas. Will she be able to change her life for better? How would her three daughters cope up with this sudden twist in fate? And, what went wrong in the illustrious family of Pandits that changed the fate of Kalyani, Sumi and Premi forever? As I read the book, I was bombarded with these and many other questions, and I could hardly put down the novel for a minute. The book is neither a murder mystery nor a suspense thriller, but it is an unputdownable page turner, with each chapter egging me to read on this convoluted family drama! The story is brilliant. And, so are the characters. Be it brooding Gopal, talkative Kalyani, socially comfortable Sumi, fidgeting Aru or submissive Premi, each one of them were sketched beautifully. Women abound more in this tale, and yet each one of them is so different from the other that I could not stop marveling at author’s sheer genius, in presenting the myriad personalities of women. Even, the fewer males are handled with dexterity. Their characters are deep and mysterious, playing foil to their counterparts, yet holding their own ground. Kalyani and Goda’s open relationship, their ostentatious pride in family history and their optimism for a bright future was simply infectious. Their talkativeness provided a formidable contrast to Shripati’s silent snobbery, Aru’s constant brooding and Sumi’s unflinching indifference. Moreover, the narrative simply transcends the barrier of time, as the story effortlessly shifted gears from present time in Bangalore to the glorious past in Ganeshkhed to tragic event in Bombay and Shivpur. Full points to Shashi Deshpande for an engaging beginning, a marvelous story, thoughtful characters and brilliant language! However, sadly, I can not say the same about narration. There is nothing wrong with diction, syntax or style. It is brilliant in parts, in fact loaded with pearls of wisdom and would have been a rare jewel, only if Deshpande had handled the switch from third person to first person a little more dexterously. The narration is predominantly third person and unobtrusive, but, I do not why Shashi kept shifting into first person occasionally, confusing me as to who is the I, especially when there were too many persons involved and absolutely no quoting symbols were used. I felt as exasperated with these punctuating moments, as I was with the non judicious use of “HE” in Wolf Hall. Another small irritant was that Aru and Charu do not shy away from calling their mother by her first name. I had a hard time accepting Sumi in the role of mother due to this incongruity. To add to my confusion, it was not till the very end that one of the characters pointed this out, and by that time, it really did not matter anymore. Moreover, I did not find the climax very convincing. It was clear even in the beginning that the story would have a tragic end. But, the actual ending was too shocking for me. I expected some hope, a better perspective, at least for the third generation. But in A Matter of Time, no such solution is presented. Even Rohit, who is supposed to be the future of Aru, remains conspicuous by his absence both from Aru’s Birthday party and the subsequent tragedy. 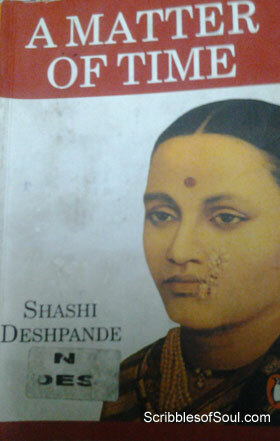 However, the dampening end can hardly mitigate Shashi Deshpande’s wonderful creation. The story transgresses time, tradition and expectations. Ironically in a novel titled ‘A Matter of Time’, the time itself or at least the era and place hardly mattered. It was only in the very end that the narrative was given a timeline as the personal tragedy of Pandit family juxtaposed with the national tragedy of Rajiv Gandhi’s assassination. Somewhere else, it would have hampered the story, but here, it added to its timeless classic appeal. Another interesting fact I noticed was that the non living Bungalow was named in the very beginning, roots of its creation described, its history lucidly explained. But, it was only in the very end that Sumi, Premi and Madhav were named properly. I kept remembering the irony of Naga, where a similar tactic was used and just like R. K. Narayan, Shashi has also won my respect for her innovative use of literary techniques and symbolism. In a nutshell, A Matter of Time is a thought provoking treatise on human psychology. A must read for serious readers, who expect their novels to be stimulating reserves rather than a simple time pass!